Stop losing clients by implementing this amazing app. Make your cart easily generate sales. Do you want to increase the number of sales? Just turn on the app and set the reminder time. A bar at the top of your site and the flicker of the tab in the browser will remind your customer to complete their purchase. Sometimes users leave Shopify stores with their orders abandoned. Want to bring them back? Use recovery emails with fully customizable messages to restore their cart and complete their purchase with this app. Easily create messages by changing colors and sizes, fonts and backgrounds using our comprehensive editor. 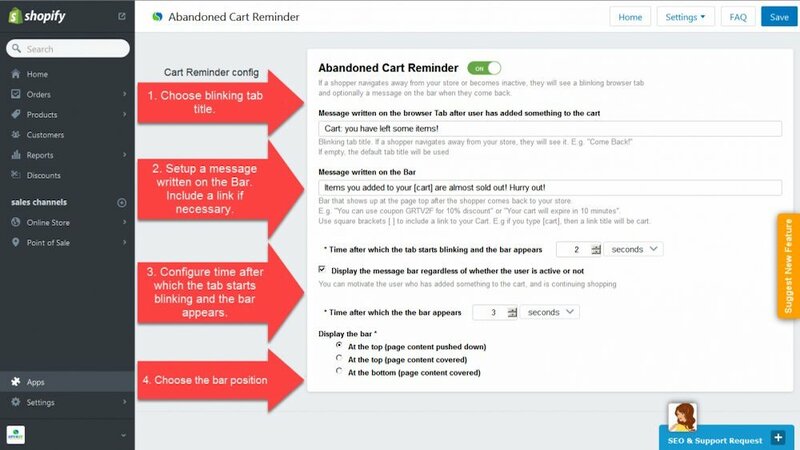 Give users an extra reason for coming back with the abandoned cart Shopify app! Set up discounts or coupon codes to motivate customers anencourage sales. The fastest installation procedure will get closer, faster to sales increases. A few seconds of waiting and your Shopify store will start generating revenue. 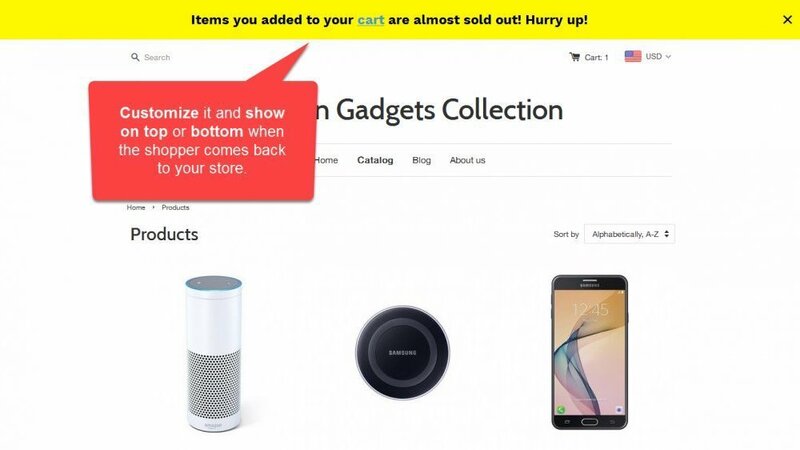 Let us introduce you to our Shopify Abandoned Cart Reminder App, a perfect tool to manage uncompleted purchases and attract the customer’s attention. 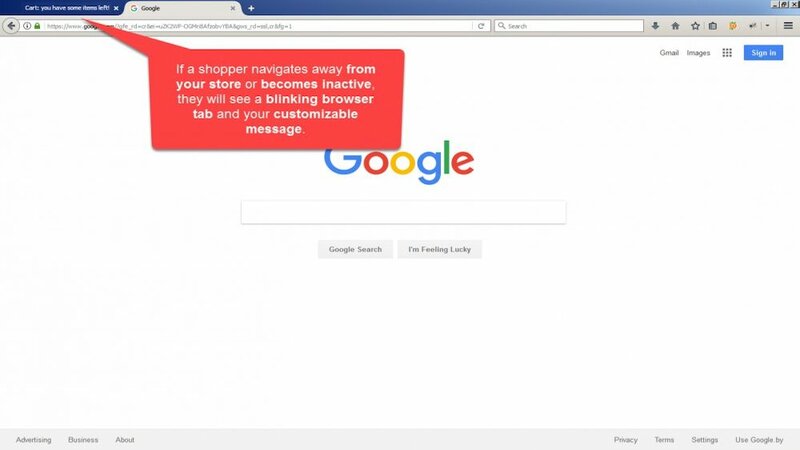 First of all, it tracks your Shopify visitors and their cart status and in the event that the user has gone to another tab, the app will have the abandoned tab blinking on the store’s page. Transform an uncertainty into sales! Great app, easy to use. Many thanks you deserve 5 star. Highly recommended. The best app! I recommend this app. You will never look for anything else. Great app to use, I’m very pleased with their work because it really works! Invaluable to make money on the back end of my store’s sales strategy. Sorry but I wanted to rate this App 10 but only found 5 stars! …Helpful team and easy to use app. Well done! 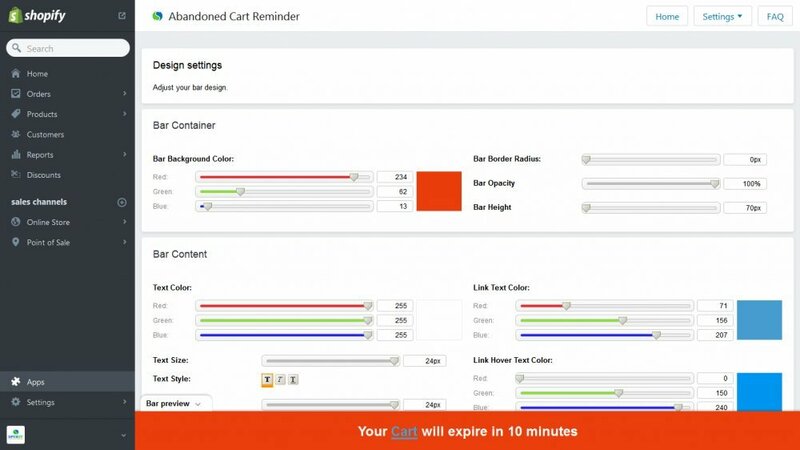 Try Abandoned Cart Reminder now!